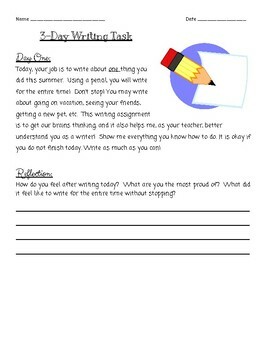 It's SO hard to find writing assessments for the first few days of school! Should the kids write an essay? Should the kids just write about a topic of their choice? What should I grade? This activity is perfect for teachers who are looking for a pre-assessment to help better understand where their students are in regards to drafting, editing, and revising. On the first day, the students only DRAFT about a topic. On the second, the students REVISE, and on the third, the students EDIT. 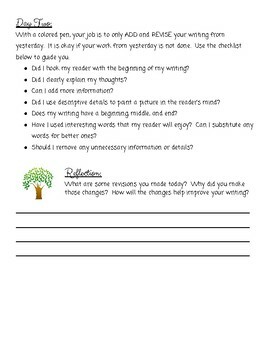 Each day provides a task and a reflection piece and helps YOU assess your students' levels. In three days, you have a basic assessment for your records and you can better prepare your students for the rest of the year!